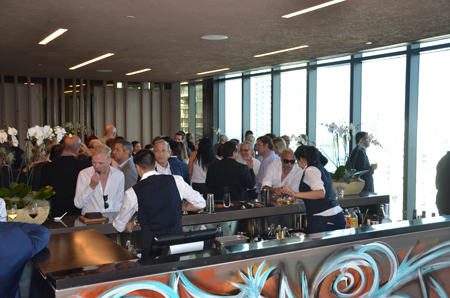 Guests learn about The Underline at a stunning reception in new EAST, Miami hotel. 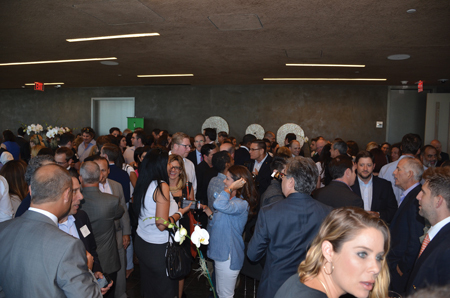 On Wednesday, May 25th, 39 Floors high above Brickell Station, some 200 plus guests enjoyed a cocktail reception in the new EAST, Miami Hotel celebrating Swire Properties and the community’s support for The Underline, the transformative ten mile linear park and trail under the Metrorail. 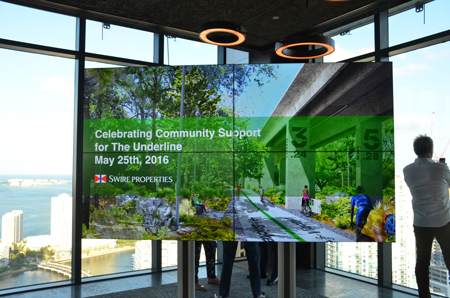 The reception was hosted by Brickell City Centre, Swire Properties and The Underline. 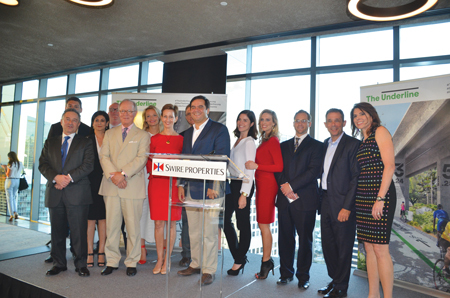 Brickell City Centre is Hong Kong headquartered Swire Properties $1 billion mixed use development in Miami’s downtown, and East, Miami Hotel, the group’s first hotel property in the United States. 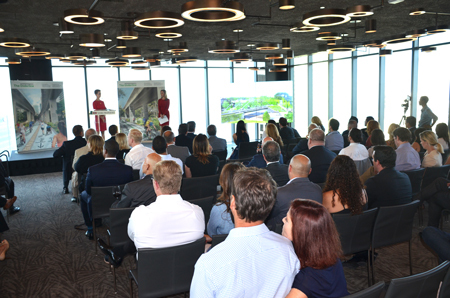 Guests saw video and heard presentations and demonstrative support of the project from the community’s elected and business leaders. 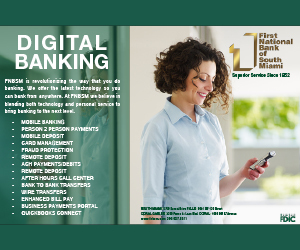 Mistress of Ceremonies, Jessi Berrin. 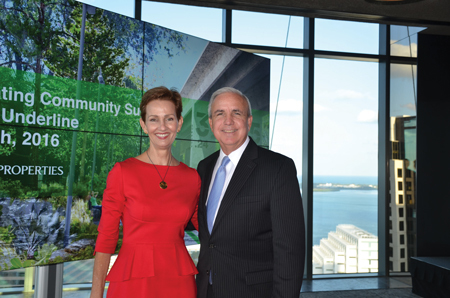 Director, Government & Community Relations at Baptist Health South Florida brought together a seamless presentation which began with remarks from Miami Dade County Mayor Carlos A. Gimenez. 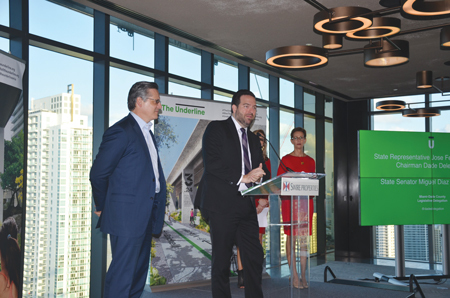 The Mayor noted that The Underline is “transforming Miami” and making it the “city of the future,” with the county’s commitment throughout. 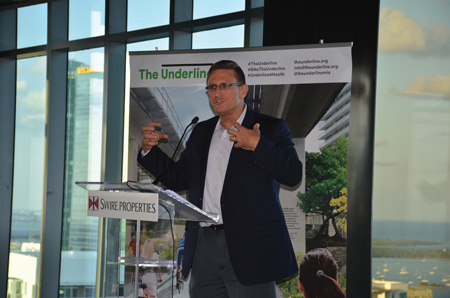 George Abbott of the Knight Foundation, which has given $500K in a grant to The Friends of The Underline for master plan development, noted that “public spaces define a city” and announced a $5000 award for the 2016 Emerging City Champions Fellowship to implement one project in one year that will improve mobility, public spaces or civic engagement in their home cities. 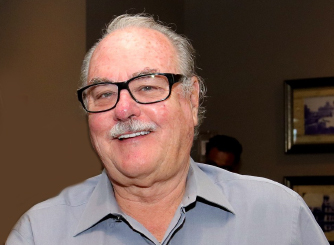 (See page 31.) 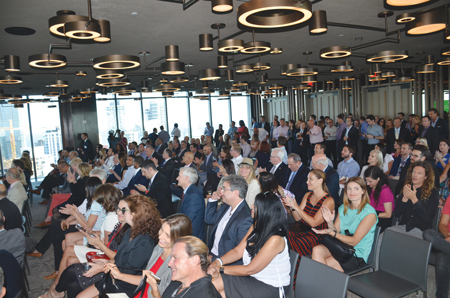 President of Swire Properties Stephen Owens, announced a $600K Matching Grant for the development of the first phase of The Underline at Brickell Station, and urged other developers in attendance to join in this effort. 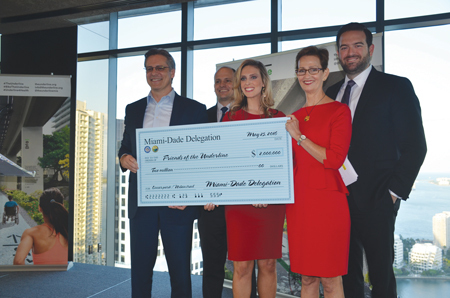 Senator Miguel Diaz de la Portilla and Dade Delegation Chair Jose Felix Diaz both spoke to the state funding commitment for the project and presented a $2million check to the organization. 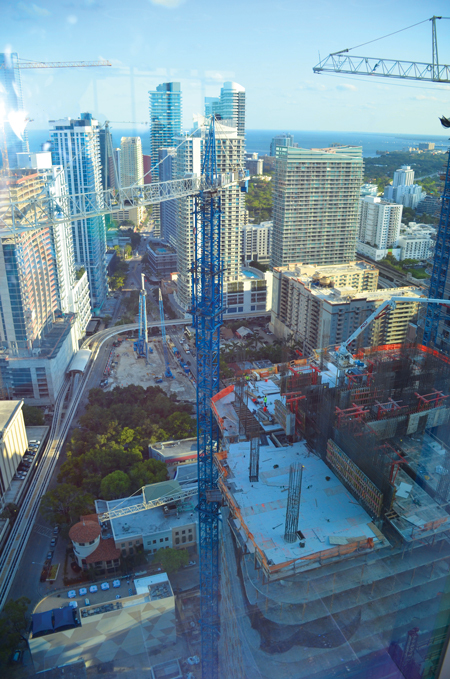 Ground-breaking for the “Brickell Backyard” Underline plan is planned for fall 2017. 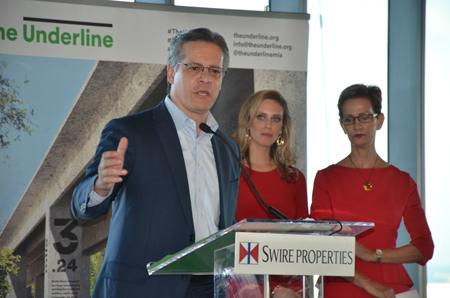 To learn more about The Underline, go to TheUnderline.org. 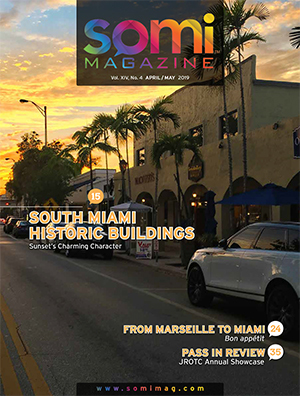 See also SOMI Magazine’s cover feature of April/May 2015 (www.somimag.com). 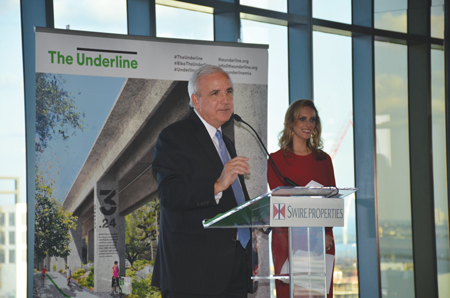 Mayor Carlos A. Gimenez and Meg Daly, CEO/President, Friends of the Underline. 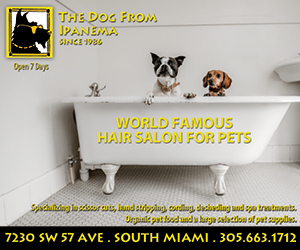 Dade Delegation Chair Jose Diaz and Senator Miguel Diaz de la Portilla. 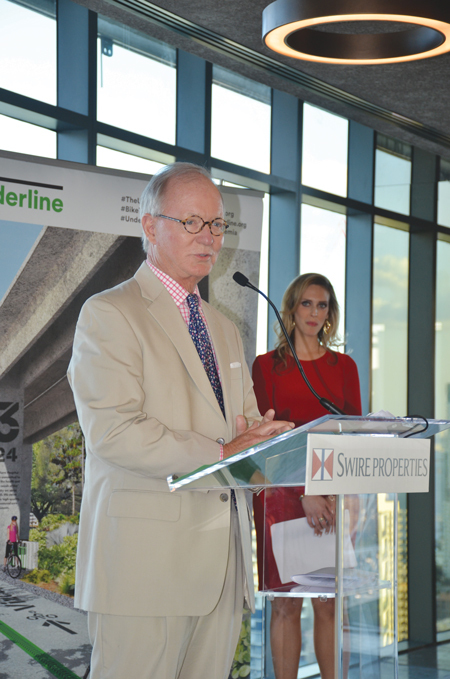 Swire Properties President Stephen Owens at the podium with Jessi Berrin in background. 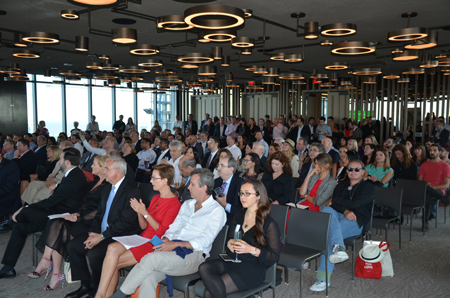 The Friends of The Underline board and donors pose for a group photo.